The Weather Cover Rain Fly Shelter from 5ive Star Gear is an outdoor essential--perfect for campers, backpackers and hunters alike. 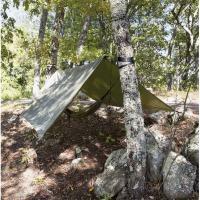 The large fly provides shelter from the rain and shade from the sun, protecting you, a hammock and all outdoor gear. The cover is crafted from tough, polyester rip-stop fabric with a polyurethane waterproof coating, making it both highly-durable, resistant to tears and virtually waterproof. Reinforced corners with grommets strengthen the material in areas of high wear. The shelter comes with six guylines, six metal stakes plus a tensioner, allowing for effortless securement to the ground or other structures in the wild.